Associate Professor Matthew Epperson is a leading expert in studying a national trend towards reducing the time that criminals are imprisoned. The movement, called decarceration, tries to replace incarceration with other choices. It also examines approaches that respond to criminal behaviors that are more human and just. Epperson developed his interest in the incarcerated as a social worker in a jail in Michigan and has gone on to co-found a national research project on the issue. His published work looks at the role mental illness plays in arrests and imprisonment. He is Principal Investigator for the project "Advancing Intervention Science for Probationers with Serious Mental Illnesses." The study, involves developing and testing a new intervention to reduce the risk of criminal behavior and improve treatment adherence among people on probation who have serious mental illnesses. The work of Associate Professor Mosley looks at how social workers can influence public policy making. Frequently the feedback loop is broken between the officials who make decisions about the policies and the agencies that are responsible for implementing the policies, she finds. She examines the services provided for people who are homeless and found a great variation in the ways in which local organizations participate in the collaborative governance organizations established by the US Department of Housing and Urban Development. Mosley found that larger networks have a lot more capacity for advocacy, but having more staff support often leads to providers taking a step back. Smaller providers can feel lost in the system, she discovered. Social service agencies can increase their voices by participating in coalitions to advocate their positions, she says. Assistant Professor Leyla Ismayilova studies child maltreatment in one of the world's poorest nations, Burkina Faso, in western Africa. Her work shows how family counseling can improve the lives of children, who experience emotional and physical violence and who often work away from home to help support their families. She studies how the counseling can be combined with an economic project that helps raise incomes for the very poor. Hers is among the first experimental design to test the impact of integrated psychosocial and economic-empowerment interventions on the child protection and mental health outcomes among families in very poor countries. Her work shows the combined intervention led to a reduction of hunger among children as well as lower symptoms of depression and trauma. Mothers who participated in the combined intervention showed reduced use of harsh discipline methods. 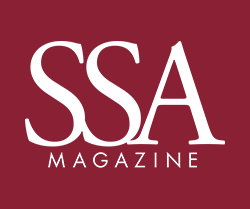 As we go to press, we are commencing the four-year term of the nation's 45th president, whose election has generated many concerns, worries, and conversations at SSA. And although we start 2017 still with much uncertainty, we do know the election and new Administration present extraordinary implications and challenges—some which directly impact our community and those whom we serve. In this issue's conversation, Deborah Gorman-Smith discusses the importance of community collaboration and evidence-based research with Pastor Chris Harris, Pastor of Bright Star Church and founder and CEO of Bright Star Community Outreach, and Franklin Cosey-Gay, project director for the CCYVP. In 2013, Haijing Dai, Assistant Professor of Social Work at the Chinese University of Hong Kong, spent six weeks working at an elders' home in Hangzhou, a city of 2.5 million on China's eastern coast. Before "Fight for 15" helped make raising the minimum wage a national political issue, a more modest but no less controversial movement swept the United States, provoking fierce debates about the economic costs and soical benefits of raising wages for the lowest paid workers. The meaning of the word "scale" is more than size, distance, or other standard metrics that we might commonly associate with the term; it is also a matter of perspective, according to the new book Scale: Discourse and Dimensions of Social Life (University of California Press) co-edited by E. Summerson Carr. When waves of military personnel scarred by trauma started returning from overseas, Belleruth Krepon Naparstek AB '64, AM '67, believed she could help them find relief by learning how to use the mind to heal. In Nearly two years of field research on Latin American police forces, one of the most compelling expressions of the role of the police came during a conversation with a former Director of the Colombian National Police, who told me that police officers are "the materialization of the state, what [citizens] could see of the state." In Chicago, and in far too many cities in the US, what you "can see of the state" often depends on characteristics such as your race or ethnicity, class, or neighborhood. New Assistant Professor, Alan Zarychta, studies why some Latin American health systems produce better outcomes. New Assistant Professor, Yanilda María González, explores the consequences of violence, inequality, and corrupt policing.